When is Encapsulating Mold Appropriate? Encapsulating mold is a process in which a mold sealant is applied to a surface in order to prevent any mold there from growing or spreading. In most cases, materials that cannot be adequately cleaned of mold should be removed and replaced. That's why things like moldy carpet and moldy drywall are taken out of the home. In some cases, though, something cannot be adequately cleaned but cannot be removed, either. Things like studs in your walls or some ceiling rafters cannot easily be removed and replaced, so instead as much mold as possible is removed and then it is encapsulated. We'll explain when encapsulation is appropriate and when it's not. We'll also explain how the process is done and tell you how to get help with the job, including some free advice from an experienced professional. Encapsulation is appropriate only when mold cannot be fully removed from a surface and the moldy material cannot be removed and replaced. It is typically done on wooden surfaces, such as the wooden studs within walls (see picture below). Moldy drywall can be removed and replaced fairly easily, but not so with the studs. It is difficult, if not impossible, to remove mold completely from porous surfaces like wood because microscopic mold spores get into the tiny pores in the wood. 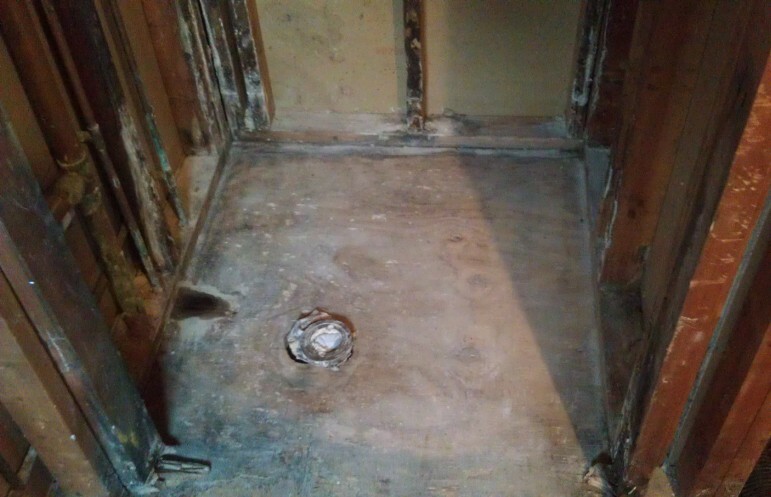 Therefore, even if it looks like the mold has been removed, small amounts can remain unseen in the pores of the wood, as with other porous materials. 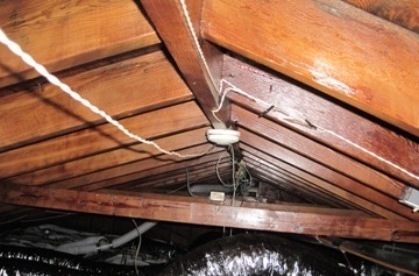 That's why encapsulation is recommended if the moldy wood cannot be removed and replaced, to make sure those trace amounts of mold cannot grow and spread at a later time. When Is Encapsulating Mold Not Appropriate? Don't encapsulate mold on surfaces from which it can be removed. Generally mold can be removed from non-porous surfaces, such as metal, glass, and tile. If you're not sure if mold can be removed from a surface, or aren't certain about the best way to remove the mold, consult a professional for advice. Mold remediation professionals often offer free in-home consultations, so you can get some expert advice at no cost to you. In a moment, we'll tell you how to schedule a free consultation. Don't encapsulate mold on materials that can be removed and replaced, either. Things like drywall or wooden furniture should be taken out of the home and discarded, not encapsulated. It might seem like less work to encapsulate mold on drywall, or more affordable to encapsulate mold on furniture rather than buying new furniture, but removing and replacing moldy items that cannot be cleaned is both safer and more effective than encapsulating mold. How Do You Encapsulate Mold? Before encapsulating mold, as much mold as possible is removed by scrubbing the moldy surface with a fungicide. Professionals will sometimes sand wood to remove additional mold that could not be removed by scrubbing. Sanding mold is rather hazardous though, because it sends so many microscopic mold spores flying into the air, where they are easily inhaled. Only professionals should attempt to sand moldy wood. After as much mold as possible has been removed, a mold sealant is applied. Note that you should never paint over mold with regular paint. Regular paint, or even mold-resistant paint, will not prevent mold in the wood from growing or spreading. It will only make it harder to see the mold when it does begin to grow. Only a product designed specifically to encapsulate mold should be used for that purpose. The product used in the above attic encapsulation is Foster 40-51 - Sheer Defense. It is expensive, but is the best encapsulate on the market. If you think mold in your home may need to be encapsulated, we recommend scheduling a free in-home consultation with a mold remediation professional. An experienced professional will visit your home, inspect the mold, and let you know if encapsulation is necessary or if the mold can be removed. If you're hoping to handle the mold removal in your home yourself, know that you have the option of hiring a professional to help with mold encapsulation only. You can opt to handle the rest of the job yourself. And whatever you decide, you can benefit from some free advice from an expert in the field. Just follow this link to find qualified mold removal professionals offering free in-home consultations in your area.